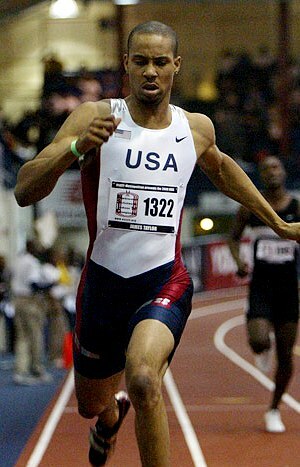 Jumping and winning at the 2008 Penn Relays. If Nansemond River VA senior James Taylor continues to build on his impressive resume this year with outstanding post-season performances in the coming weeks, the multi-talented star’s developing fans will probably assume he’s a long-timer in the sport that somehow they just didn’t hear of until the last year or two. Surely, he had to have been a youth star, who perhaps has just really come on later in his prep career. But the truth is that it was thisclose to there not being a James Taylor chewing up the track, or spraying sand 24 or 25 feet from takeoff in the long jump pit. Instead, picture the athletic 6-3, 191-pounder directing traffic on a football field – not as a quarterback, but as a drum major. Marching band has been his passion and might have been his only big passion as a high schooler, if it hadn’t been for Coach Britt – and what Taylor summarizes is perhaps some divine intervention. With Britt’s coaxing, however, Taylor came out for track as a sophomore and has attracted a greater spotlight than he could have imagined. Although bigger and taller than a lot of top dashmen and leapers, he has proven to be not just an excellent sprinter, but one with great range from 60 meters to 500 meters indoors, and the 100, 200 and 400 outdoors. And of course there’s the long jump, where he first really attracted national props with his win at the Penn Relays as a junior. At the Virginia State Indoor meet this winter, he made history with victories in the 55 (6.26), 300 (34.07), 500 (1:05.14) and long jump (24-01.25) – the first athlete ever to take four VHSL individual titles in a championship. Then outdoors, he won 2 golds (21.68w 200 and 47.12 400) and 2 silvers, with his best mark coming in a tough LJ loss to Justin Hunter. Taylor had his first legal 25-footer and it took a US#1 mark to beat him. With the post-season and his college career ahead, he took a few minutes to answer some questions with DyeStat senior editor SteveU. 1) Congrats on your performances at the state meet. I wanted to go through some of what the weekend was like for you. First, can you tell me about the long jump? It was certainly one of the great battles, nationally, this year- with you and Hunter both going over 25 feet. It was very exciting, because I had competition and it was only my second time jumping this year (outdoors). 2) How did you feel about each of your running finals Saturday? Obviously you were in contention for all three dashes, but the short races, especially, you had very close competition. How would you break it down and how did you evaluate it a the end of the day? I felt like I had to win all of the events that I was entered in, but was also thinking about it being my last high school meet (regular season). At the end of the day, I was satisfied because I had people to challenge and because I PR’d in the 400 and long jump. It was a great track meet. Winning the 200 at NSIC this year. 3) You also had an amazing quadruple at the indoor state meet, winning four events in that instance. Comparing the two, is there any disappointment in not winning as many outdoors, or did you know it would be a different and perhaps harder challenge? Well, indoor states was the best track meet in high school history … and being the first to win four events indoors was very special, because it showed that it can be done. As far as any disappointments outdoors … no, because I did the best I could and I’m happy with that. 4) You had some good national-level experience at National Scholastic this past winter. What specifically are your plans for the rest of the spring and summer now, and what are your goals at the national level? Well, I want to win nationals, and after that get ready for college! 5) I’ve read comments from Coach Britt that it was a challenge to even get you out for track and field, and that you were/are a drum major in the band and were pretty content with that, at one point, as far as extra-curricular activities. Tell us the story about how Coach went after you for track and how you finally got into it. Also, are you in any other sports or have you been in the past? It was crazy, because I had no interest in track – I didn’t like to run. But one day I just found myself on the track. I say it was God, because after awhile Coach had given up and I was certain I was not going to run, so I say God had a lot to do with this. I was in basketball from first through fifth grade, and I loved that sport, but I lost that love and tried something different – and that was band. 6) I’ve also heard you’re going to Norfolk State. Can you tell us how that decision developed? Have you worked things out so you’ll be able to do both track and band? What kind of interests do you have academically and how does Norfolk State meet those interests? My decision to go to Norfolk State was not hard; in fact, I had always wanted to go there, reason being is because it was one of my childhood dreams. My future in the band is undecided and I really don’t know what will happen in the future to come. I would like to be a representative of a company so I will be majoring in business. 7) One article I saw said that you weren’t “cocky,” but that you admittedly loved attention. I imagine that in being a drum major, you are the center of attention, but also need to be a real leader and be very responsible. Can you tell us about that part of your personality and how that’s evolved? Is James Taylor at his best when the pressure is on, all eyes are on you and it’s all on your shoulders? I am indeed at my best when the pressure is on; it brings out the true talent I have and more. I am a leader on and off the track. People like that quality about me and I will always have that quality about me. 8) Finally, can you talk about your support system as an athlete? I understand you train both under your high school coach, Coach Britt, and have a club coach as well. Is it a challenge sometimes to have that all mesh together? Also, is your family supportive and inspirational for you both in band and track? Both of my coaches understand, and they come to agreements together for my well being. I talk all of what is said and bring it to the track. My family plays a big part in my track life and they support me in every way that they can.